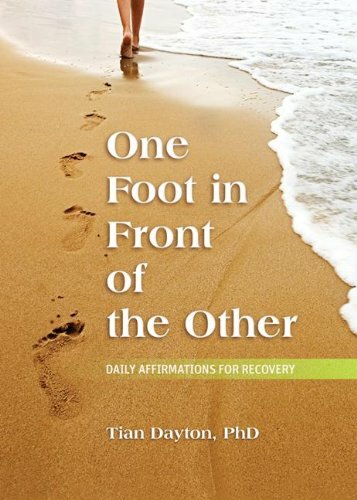 This is a wonderful collection of affirmations for recovery from addiction, childhood trauma, dysfunction or relationship loss issues. All recovery of this nature is slow and the individual literally has to tread carefully -one foot at a time – counting small gains and victories along the way. This book is meant to accompany her/him on the journey – a pocket companion of sorts providing inspiration and motivation through the day, helping the individual to gather strength and hope for living one day at a time. Tools of the recovery programme: These have been incorporated into affirmations so that they can be remembered and focused on. Scientific information: The author has included brief research insights and information about the value of positive thinking, faith and prayer, wherever appropriate. Inspiration: There are some truly inspiring quotes and readings included. The affirmation: Other people have their own Higher Power and it’s not me. About the author: Tian Dayton, Ph.D., the Director of Program Development for Breathe Life Healing Centers is the author of 15 books including The ACoA Trauma Syndrome and Forgiving and Moving On. Visit her at: tiandayton.com. I found the book very inspiring and found that many of the reflections, affirmations and inspirational quotes can be applied to not just to addicts but to us all. I would certainly consider giving it as a gift to someone who is on the path to recovery. Disclosure: I received an ARC from NetGalley in exchange for a review. Today I am linking in to the Write Tribe Festival of Words – 2 – for the prompt ‘Books’ and also to NaBloPoMo. One foot in front of the other is the surest way to get there. We all need a little motivation now and then. Will have to check out this book. I believe I will pick up this book. Sounds like a great read!! Sounds like a good mantra for taking up any big task – one foot in front of the other. Hmm….I think I’ll add this to my Christmas list, sometimes we all need a bit of motivation / inspiration to give us time to reflect, heal and move on. Sounds like just the sort of book I’d love to read! I am an affirmation-junkie! This one is a keeper, Sid – such a collection of wonderful thoughts.